...... DVD-RW/DVD+RW, DVD+R DL, CD-RW and CD+R/CD-R; Button to refresh the CD/DVD drive in case the CD/DVD inserted is not being detected by the computer; Various burning modes to meet your needs and the test mode is provided to simulate burning error detection; Adjustable Burning speed (depends on the capabilities of your system and your CD drive); Options summary provided to review all the settings you've decided; Automatically eject your drive after conversion. 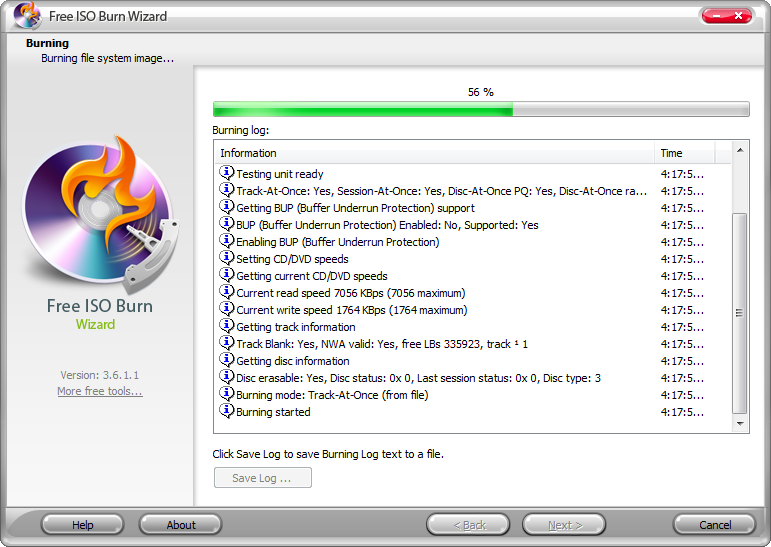 With Free ISO Burn Wizard, you can: Easily burn ISO image files to CD/DVD discs with high speed; Burning ISO discs for data storage and backup; Burning ISO image to CD/DVD for better distribution; Burning game ISO for your video game console. Burn audio from MP3, WMA,FLAC, WavPack,OGG. Qweas is providing links to Free ISO Burn Wizard 4.1.7 as a courtesy, and makes no representations regarding Free ISO Burn Wizard or any other applications or any information related thereto. Any questions, complaints or claims regarding this application Free ISO Burn Wizard 4.1.7 must be directed to the appropriate software vendor. You may click the publisher link of Free ISO Burn Wizard on the top of this page to get more details about the vendor.